Perhaps the standard by which all other yearbooks should be judged. All Football League clubs detailed, along with Scotland. 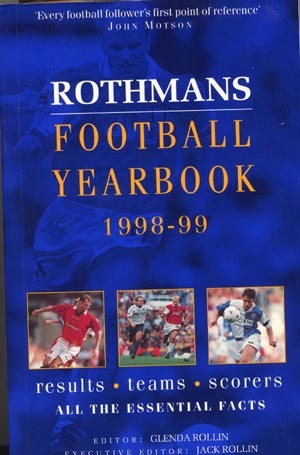 Also includes amateur level coverage, School Boys, Brit internationals, Euro league results, World Cup, etc. This work does not really give you a "feel" for the game, as it is basically a statistical resource. However, as such, it does an excellent job. The massive weight would come in handy if you had to defend yourself against an assault by the Millwall firm or West Ham's ICF. The individual player info is OK, limited to stats, but it's fairly complete. All the photos are black-and-white. Basic stats on every game played in the 4 Leagues are included. Highly recommended, but you probably won't be purchasing on an annual basis.